Black Line Marker Paint 750ml. Line marker paint is quick drying, tough, hard wearing and is su..
Blue Line Marker Paint 750ml. Line marker paint is quick drying, tough, hard wearing and is sui..
Green Line Marker Paint 750ml. Line marker paint is quick drying, tough, hard wearing and is su..
Orange Line Marker Paint 750ml. Line marker paint is quick drying, tough, hard wearing and is s..
Red Line Marker Paint 750ml. Line marker paint is quick drying, tough, hard wearing and is suit..
White Line Marking Spray Paint 750ml. 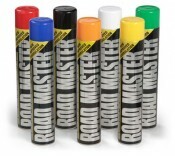 Line marking paint is quick drying, tough, hard wearing a..
Yellow Line Marker Paint 750ml. Line marker paint is quick drying, tough, hard wearing and is s..
Yellow Road Marking Crayons These road marking crayons are rectangular and unpointed yell.. Temporary Line Marker Paint 750ml can be used on most surfaces where a temporary mark is req..
Two Wheel Line Marker Applicator You can mark anything with the Two Wheel Line Marker Appl..